Konya rugs: are famed and desired for their magnificent color, lustrous wool, and unfettered bold tribal drawing. Undoubtedly the most sought after of antique Turkish village rugs, Konyas often have stepped geometric medallions, so-called “Memling Guls,” arranged as allover or central designs. But whatever the pattern, these rugs consistently display a masterful combination of assertive drawing and striking color juxtapositions. In a sense they are the antique Turkish counterparts to Caucasian Kazaks, and they are no less sought after by collectors, although they are generally older and far rarer. Tribal design elements and vibrant colors abound in these tribal Turkish masterpieces. So much so that many antique rug collectors are almost always immediately drawn to the Konya category of Turkish rugs for their bold use of colors, contrast and patterns. The vivacity of the colors breathe life to the shapes themselves, and the strong use of outlining allows individuals to focus on the geometric medallions and floral motifs as they are used to define the foreground at both the borders and central heart of the Konya rugs. 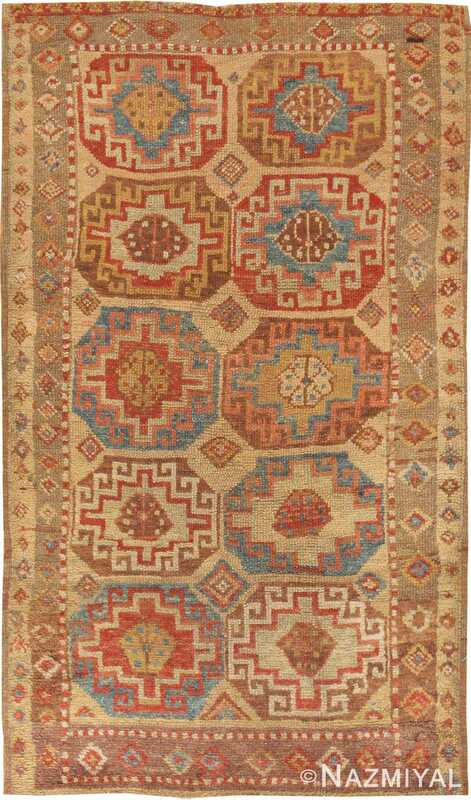 The allover or central designs may vary depending on the nature of the antique rug itself, though the colors are always arranged to create a network of attention. Like many other tribal carpets, the Konya rugs are unique because of their use of straight lines. These angular sections along the rug are meant to create a sense of grounding for the colors within. Because the colors are often so whimsical in direct contrast to the grounding, the resulting Oriental carpets have thematic juxtapositions as much as they do visual ones. This results in a much more visually pleasing rug that can be applied as a versatile connection between many different elements in an interior design. Strong, lustrous wool is often used as well, which results in a more long-lived carpet that the viewer can enjoy. Because of how saturated the colors often are, these antique Turkish Konya rugs are strongly recommended for use in areas that would benefit from the attention. Sections of the home such as the living room, den, or bedroom may all benefit from the inclusion of these rugs because of how defining they are and how well they can set the scene for other furniture elements to follow. The colors may also be used to bridge gaps between various articles of furniture as well, especially if there is a decorative theme that the viewer has in mind when they arrange the Turkish Konya rug with other similar pieces.